Wire and cable manufacturers carry a heavy burden; if they fail to fill their customers’ just-in-time orders, those customers might have to shut down entire production lines until the vital components come in. Understandably, cable providers will do just about anything to fill their orders reliably. But that leads right into another problem. If a cable manufacturer overproduces, they’ll be stuck with a backlog of product. The challenge is to remain flexible enough to drive cable manufacturing lines into high-gear during periods of increased demand, while still keeping lines running efficiently when customers limit orders. There’s a whole universe of analysis devoted to forecasting production demands; industrial engineers write books about the topic. But regardless of the strategy cable-and-wire manufacturers apply to plan their own production schedules, one aspect of the manufacturing industry can help contribute to the flexibility providers need to stay lean and competitive: Material handling systems. So what does a flexible material handling landscape look like for cable-and-wire manufacturers? Ergonomic design and safety for workers. Worker safety is a core value for any reputable cable manufacturing operation. But an unsafe workplace is also the fastest way to fall behind on orders. Not only do injured workers reduce the trained workforce, possibly during high-production times, failure to provide a safe workplace opens companies up to costly OSHA fines or even total shutdowns until safety issues are addressed. Ergonomic cable-handling equipment includes dependable payout devices, automated reel-filling equipment, and reel-handler attachments for forklift fleets. Highly flexible storage with compact footprints. Reel-handling equipment can double as powerful storage options. Think of Parallel Reel Payouts in order-filling stations, reel-roller stands in the warehouse, and Electrical Material Carts in the order-picking aisles. All of these options allow for access to product, but they also store that product until orders come in. In order to remain flexible, reel-handling equipment should double as storage solutions wherever possible. Efficient, accurate measurements for filling orders. Overfilling orders leads to serious efficiency drains for cable manufacturers. Underfilling is simply not an option. However, once cable is on the customer’s reel, it’s virtually impossible to measure accurately. The solution is to choose reel-filling equipment that accurately counts linear footage during payout. The Spool Winding Trolley, for instance, includes a triple-wide encoder wheel that counts linear footage during the act of filling an order reel. This creates accurate order fulfillment without adding time for separate measurements. Without a flexible, robust cable-production sector, the entire electric industry falls apart. Globally, the wire-and-cable industry contributes a full quarter of the electric industry’s output value, according to one report. 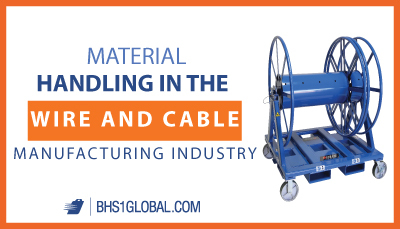 Material handling in the wire-and-cable manufacturing industry is just one pillar of flexible line-feeding, but it’s an important one. If your logistics systems are perfect, your lines are set up for efficiency, and your workforce is right-sized — but you still run into problems adjusting to the ebbs and flows in demand — look to material handling systems for a solution. “Cable and Wire Industry 2018 Forecasts (Electric Power, Data Communication) for Global & Chinese Regions.” PRNewswire. PR Newswire Association LLC., 15 Apr. 2015. Web. 29 Nov. 2018. “Feeding the Line.” InboundLogistics. Thomas Company, 20 Aug. 2013. Web. 29 Nov. 2018.